One of the most in-demand folding knives on the market today are assisted opening knives. This type of folding knife is equipped with a spring or bar that assists the user to deploy the blade with a simple flip of the thumb stud. As an external force is required to engage the spring and create tension for blade deployment, spring-assisted opening knives are in a way similar to manual folding knives, only that they have an inset spring to allow for much quicker opening action. 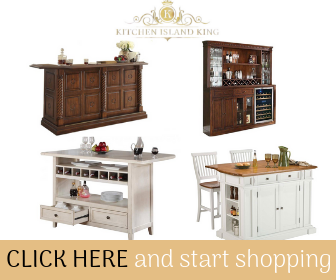 If you are shopping around for the best assisted opening knives, you can easily be overwhelmed by the whole raft of knife brands and models available for you to choose from. But do not despair. With a little assistance, you can reduce the stress and hassle of sifting through the long list of assisted opening knives found on the market right now. Consider narrowing your search down to these most sought-after options. Have you ever used any of Kershaw’s knives in the past? Do you own one right now? If so, then you can attest to the fact that Kershaw knives do not disappoint when it comes to quality and performance. The Leek 1660 pocket knife with assisted opening system from Kershaw is no different. It is a versatile 3” blade knife that is made of 14C28N Sandvik Steel. The handle is made of 410 stainless steel alloy. The stainless steel construction ensures that the knife is robust enough to endure heavy use, provide excellent edge retention, but also offer protection from corrosion. Thanks to its SpeedSafe assisted opening technology with an ambidextrous thumb stud, you can deploy the blade with minimal effort, be it with your stronger or weaker hand. This pocket knife has a frame lock to secure the blade in the handle when not in use, and prevent the blade from closing during use. The length of this blade knife when open is 7 inches, while its closed length is 4 inches. If you are looking for a solid performance, assisted opening knife for pocket carry, you are going to love this tactical knife. 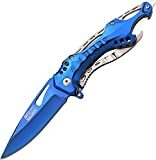 Its superb features and specifications clearly make it one of the best assisted opening knives available for today’s pocket knife aficionados. Everyone innately loves beautiful things, and it seems Smith & Wesson were looking to capitalize on this natural human tendency when they designed the SWMP4LS. The visual design of this assisted opening knife is awe-inspiring in many ways, and it complements the functionality of the knife nicely. 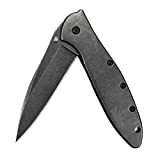 Its 3.6-inch black oxide stainless steel blade is strong, durable, corrosion-resistant, and gives a magnificent, non-reflective look. The grey aluminum handle flushed with rubber inlays provides better traction when holding the knife, but also blends nicely with the black color of the blade. The clip point, partially serrated tanto blade knife is ideal for slicing or piercing into harder materials. This knife has an M.A.G.I.C. assisted opening mechanism with finger actuator that allows faster opening. It also has a glass break feature that comes handy in crisis conditions. This knife is the perfect tool for rescue situations. The overall length of the knife is 8.6 inches, while its closed length is 5 inches. The blade length is 3.6 inches. 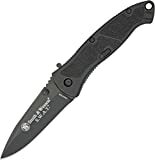 Whether you are looking for a pocket knife for everyday carry or outdoor tactical survival, this assisted opening knife from Smith & Wesson will fit the bill. This assisted opening folding knife has a 3.5” AUS-8 steel tanto blade with a straight edge. The plain edge makes this knife ideal for performing many cutting tasks. The blade comes with a black Titanium Nitride finish to provide corrosion-resistance, but also make the blade non-reflective yet attractive. The glass-filled nylon handle has a black finish that blends nicely with the blackened blade. This folding knife has a reliable safety lock to keep the blade in the handle when not in use, and secure the blade when being used. Thanks to SOG’s Assisted Technology, the blade can be quickly and effortlessly opened with one hand. If you are looking for a simple yet highly functional assisted opening knife, the Flash II is one of the best choices. Are you in need of a folding knife that opens fast and easily with just one hand? If your answer is a definite yes, then the Gerber Fast Draw assisted opening knife is built for you! This assisted opening knife’s spring action is super-efficient so you can deploy the high-carbon stainless steel blade quickly and effortlessly with a single flick. The blade is a crisp 3 inches long, while the length of the entire knife when opened is 7 inches. This means the closed length of this pocket knife or the handle is 4 inches. The handle is made of nylon and comes with a tactile texturing to provide better grip when using the knife. In case the knife’s assisted opening system fails, you can always open it in the old-fashioned style, using the thumb stud as a fail-safe. The Kershaw Clash 1605 folding knife also falls into the category of folding knives that use the assisted opening technology. “SpeedSafe” is the name given to Kershaw’s patented assisted opening system, so the Clash 1605 relies on SpeedSafe assisted opening to allow quick and efficient deployment of the blade for use. Thanks to the ambidextrous thumb stud, anyone can open the Clash with a single-handed flip. The textured, glass-reinforced handle is designed to provide a secure grip when using the knife, even in wet conditions. The locking liner prevents the blade from closing when it is being used. This ensures user safety during use. The 3” bead-blasted blade of the Clash is ideal for performing most cutting tasks without complaint, so it is a great choice if you are looking for a multi-purpose assisted opening knife. 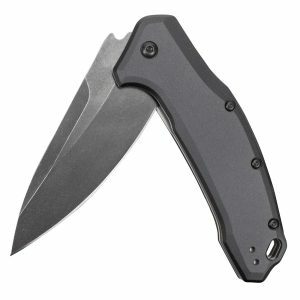 Are you looking for an assisted opening folding knife that is designed and made for rescue situations? If yes, TAC Force has a folding knife just for you – the black spring assisted opening tactical pocket knife. This knife has a total length of 8 inches and a blade length of 3.25 inches, meaning the closed or handle length is 4.75 inches. The straight-edged, medium-sized blade is made of 440 stainless steel and comes with a black finish. The handle is made of aluminum, hence contributing to the lightweight factor of the knife. The liner locking system keeps the razor sharp blade open when in use and secure in the handle when not in use. This ensures the safety of the knife user. The assisted opening mechanism is easy to operate with your right or left hand. This ensures fast deployment of the blade in times of need. This knife features a seatbelt cutter and glass breaker stub in case of emergencies. 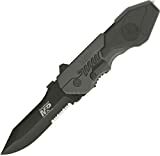 This folding pocket knife is one of the best assisted opening knives available for rescue purposes. Are you in need of an everyday carry folding pocket knife that can double up as a reliable knife for outdoorsy tactical survival? If that is the case, you should give the assisted opening knife with a 3.2” drop point blade a try. The overall length of this knife is 7.5 inches, with a closed length of 4.3 inches. The closed length of the blade is also the handle length. 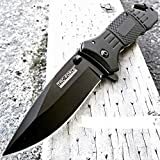 The blade is made of 4034 black oxide stainless steel and it is attached to a black aluminum handle. The stainless steel construction of the blade delivers solid performance to knife users. The aluminum handle has embedded Trac-Tec inserts to improve traction and provide a secure and comfortable grip when in use. The grooves on tang (called jimps or jimping) also help provide better grip to users. This knife offers users a double layer of protection. First, there’s the liner lock to ensure the blade remains in the handle when not being used, and to stop the blade from closing when in use. Then, there’s a safety lock that acts as a fail-safe in case the liner lock acts up. 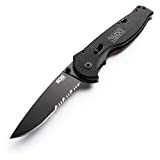 This Kershaw folding pocket knife with SpeedSafe assisted operating technology has a 3.25” tanto-style 8CR12MOV stainless steel blade that comes with a black-oxide finish. The black blade offers corrosion resistance and it can maintain its sharp edge for a reasonably long time. This reduces the frequency of sharpening. The black glass-reinforced nylon handle is packed with amazing features, including thumb studs, a built-in flipper, secure liner lock, 4-position pocket clip, and yes, SpeedSafe assisted opening. These features ensure fast, safe and efficient opening and closing of the blade. The “scales” on the handle provide better grip to users when the knife is in use. 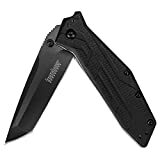 This Kershaw folding pocket knife is an excellent option for those looking for a versatile folding knife with assisted opening. This spring assist folding knife allows easy deployment of the blade with either hand. 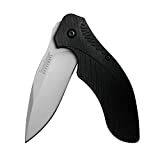 The black, decently sharp straight-edge blade locks securely inside the handle when the liner lock is engaged. The blade is strong and steady because it is made of stainless steel. The length of the blade is 3 inches, whereas that of the handle fixed to it is 4 inches. This means the knife is 7 inches long when the blade is open. To allow convenient, safe and secure carry, this knife features a pocket clip. The brown Pakkawood handle gives this knife a rustic appeal that many outdoorsy knife users appreciate, especially those that spend a lot of time in the woods. The handle provides a smooth grip yet feels solid in the hand. It also perfectly-sized for the palm. Thanks to its spring assisted opening mechanism, this folding knife allows rapid opening action by deployment of the blade with either hand. It comes with a liner lock that ensures the blade is secured in the handle when closed. The 3.75” stainless steel blade has a straight edge and a mirror finish that makes the blade look shiny. The aluminum handle is silver and gold titanium-coated to complement the reflective finish of the blade. The knife features a pocket clip to facilitate easy and safe carry in the pocket. As an added bonus, the knife’s handle includes a glass breaker and a bottle opener. The length of the knife when closed is 4.5 inches. This assisted opening folding knife is by all standards aesthetic. 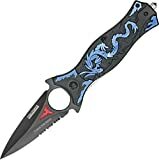 It features a black, partially serrated stainless steel blade that looks really nice, but also works well when used to cut tougher materials. The finger hole located at the rear of the blade allows better control during use. The blade is secured in place with a reliable liner lock. The aluminum handle has a dragon pattern that gives the knife a stylish and distinct look. The pocket clip ensures the knife is secured in your pocket when not in use. In case of an emergency that requires you to break glass, you can use the knife as a glass breaker. As you can see, there are plenty of quality, high performance assisted opening knives available to you. To determine which of these knives is best suited to you, it is important to first establish your particular needs. The best assisted opening knife for you is the one that fulfills your specific needs in the best way possible.